The second domain of curriculum for Customized Learning is complex reasoning. Lesson planning and unit development happens at the intersection of content knowledge, complex reasoning, and life-long habits of mind. We want learners to be – doing these reasoning processes – with this content knowledge – to practice getting better at these life-long learning habits. Not only is the focus on complex reasoning a key component of Customized Learning, but represents the higher order thinking that is one of the Focus 5 strategies for motivating students. 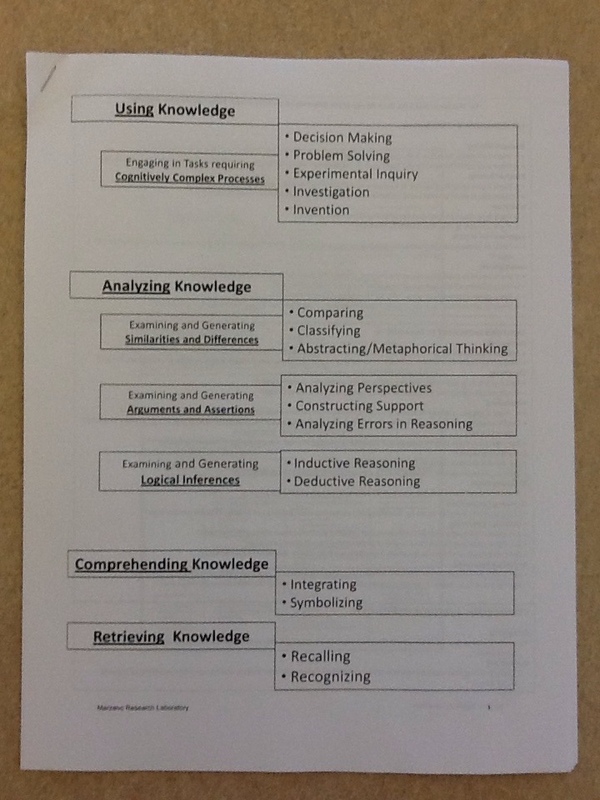 The Maine Cohort for Customized Learning has partnered with Debra Pickering and Bea McGarvey of Marzano Associates and are using the curriculum outlined in the Dimensions of Learning: Teacher's Manual as the foundation for our Complex Reasoning curriculum. The plan is to organize it into the Marzano curriculum framework of measurement topics, learning targets, scopes, and scales, just as the content knowledge curriculum has been. Teachers will be trained to explicitly teach students the strategies. The instruction in each strategy would happen when students might logically apply the strategy (not in an out-of-context separate class), and includes helping students develop an understanding of the process through examples, providing students with written guidelines and graphic organizers, and modeling, modeling, and modeling. This entry was posted in Higher Order Thinking, Uncategorized and tagged Bea McGarvey, Complex Reasoning, Curriculum Organization on December 28, 2012 by Mike Muir.